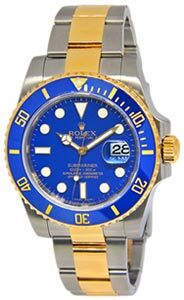 Pristine preowned mens Rolex GMT-Master II in 18k and steel features the latest ceramic bezel. Comes with its box as shown. M serial number(2007). Retail: $13,000. Lovely watch. Quick Delivery. Would buy from again. Watch arrived on time and in excellent condition. I would recommend!